For nearly 34 years, Monterey Bay Aquarium has harnessed the power of science to guide every aspect of our work—exhibit development, public policy and outreach, sustainable seafood solutions, research and education programs. In 2017, the Aquarium became one of the first 100 partners to support the first March for Science as a way to share our dedication to the scientific process. As the 2018 March for Science ramps up on April 14, we thought we’d revisit some of our greatest moments in marine conservation science over the last year. In these, and many other ways, we’re harnessing the power of science to make our world a better place. While observing Pacific bluefin tuna inside the Tuna Research and Conservation Center (TRCC), scientists noticed something…fishy about the way they were swimming. TRCC scientists logged hours of video footage and, after conducting routine medical exams, discovered that the dorsal fins of tunas move both forward and backward as they swim—especially when they hunt for prey in quick flashes of speed. Their work, reported in a cover article published in Science magazine, documented that the team of scientists discovered a hydraulic mechanism that allows a tuna to articulate its dorsal fin along a range of angles depending on which behavior the tuna exhibits. When evolution, animal behavior and body form meet in one elegant space, we call it “ecomorphology,” an area of expertise for Aquarium senior research biologist Jessica Fujii, who for years has studied how and why sea otters use tools. 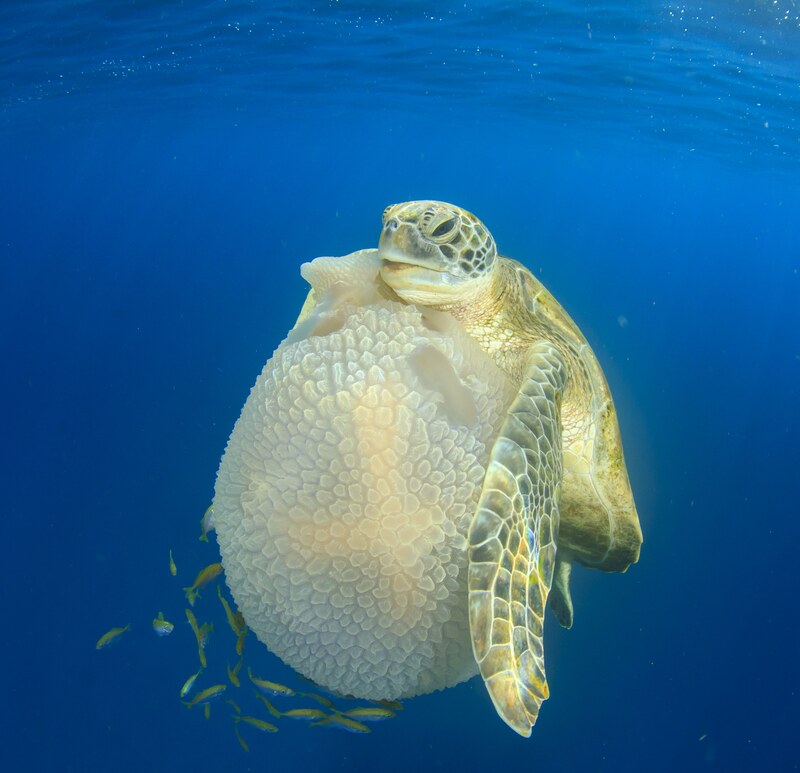 But when Jessica and her colleagues observed that sea turtles use their flippers like tools to swipe, slice and corral their food, we might call that “evolutionary serendipity”—something that sea turtles did not necessarily evolve to do, but do anyway. In a recent study published in PeerJ and led by Jessica, we learned that sea turtles use their flippers, largely designed for locomotion, to manipulate their prey. The scientists tapped crowdsourced images and videos from around the world to document turtles prying open scallops and karate-chopping jellyfish, confirming that this ancient marine reptile need not have a frontal cortex to perform such complex maneuvers. Because transparency is a key tenet of scientific inquiry, our team decided to make both the paper and the peer reviews of the paper available free to anyone with internet access. Some of the feathers in the study were from seabirds collected in the 19th century by groups like this 1885 party that landed in the Northwest Hawaiian Islands. The specimens are archived at the Bishop Museum in Hawaii. Photo courtesy Bishop Museum. 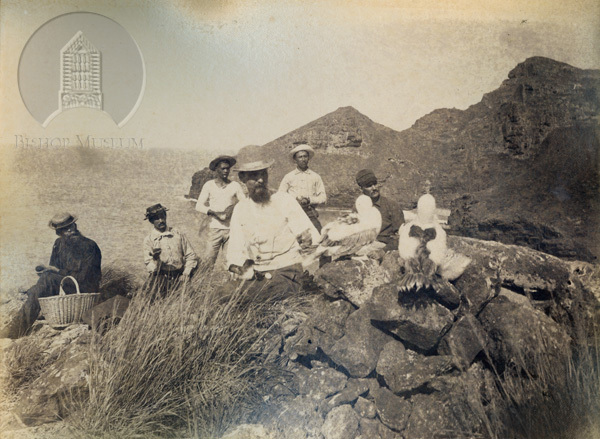 Naturalists hiking around the islands of Hawaii in 1890 could never have guessed that the seabird feathers they collected would someday be used to help tell the story of a changing ocean. But for Aquarium researcher Tyler Gagne, lead author on a new study of how seabird diets have changed over the last 130 years, the feathers played a vital role in reconstructing what seabirds have—and have not—been eating. 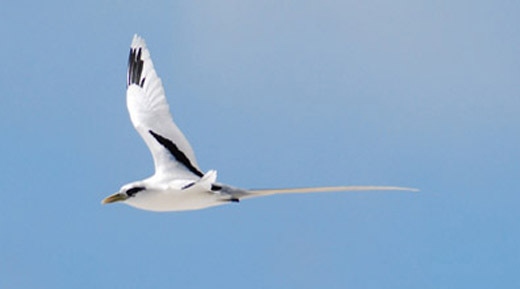 Using stable isotope analysis, Tyler and his team traced specific chemical signatures found in the preserved seabird feathers to show how, over time, eight different species in the North Pacific have shifted from fish to squid, a transition that suggests both human and climate impacts are influencing their dietary choices. For more than 30 years, sea otter researchers and animal care specialists at the Aquarium have been tagging, tracking, rescuing and rehabilitating stranded adult sea otters and pups. The data collected from 725 live strandings between 1984 and 2015 provide an intricate portrait of major threats California sea otters face as their population slowly recovers. 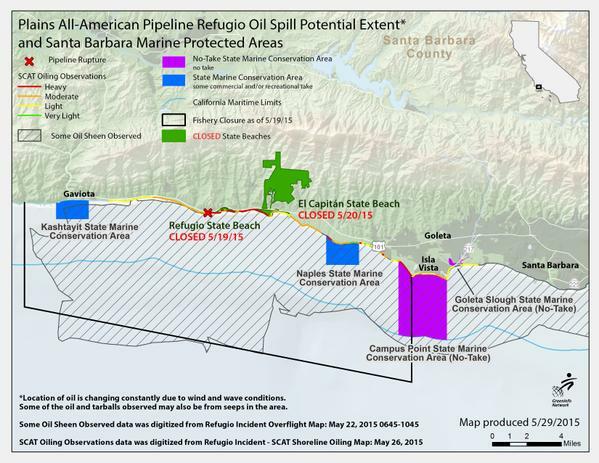 Aquarium researchers determined that the absence of significant kelp canopy coverage at the peripheries of the sea otter range, especially in waters north of Santa Cruz and south toward Point Conception, can inhibit sea otters’ ability to reproduce and survive. 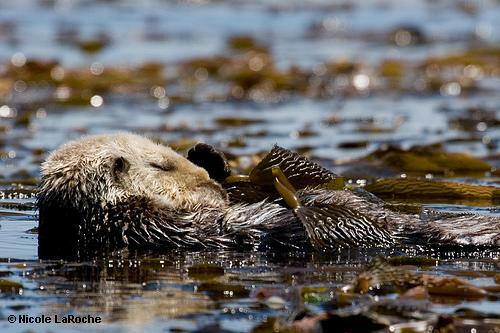 Without sufficient kelp cover, sea otters, especially reproductive females and their pups, can be left vulnerable to shark bites. 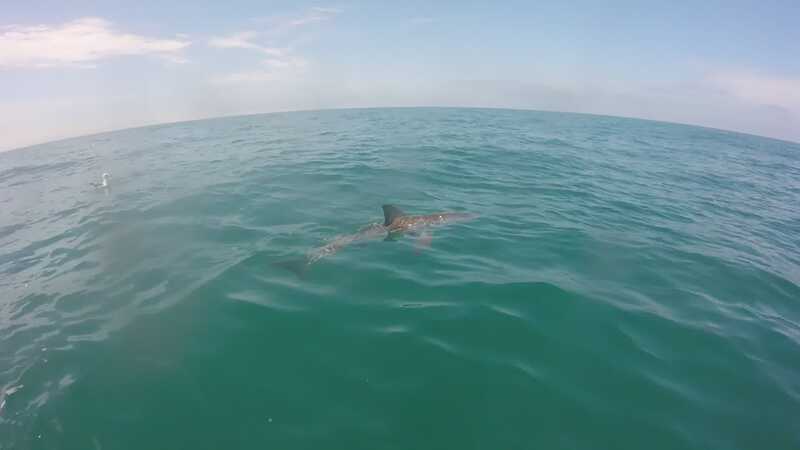 Juvenile white shark swims at the surface of Bahia Sebastian Vizcaino. Photo courtesy CICESE. After years of studying the underwater lives of white sharks, Aquarium researchers and their partners in the United States and Mexico noticed some missing links in the life history of these apex predators. Where do white sharks give birth, and where do their pups grow up? Thanks to a study published in Fisheries Research, scientists discovered that Bahia Sebastián Vizcaino, a warm lagoon on the coast of Baja California, is a nursery for newborn white sharks. This study formalized a de facto understanding that southern California was the place to find young white sharks, but researchers validated a more surprising fact about juvenile white sharks: they don’t stay in Californian waters and they regularly travel to Mexican waters and back again. These are just a few highlights reflecting the growing scope of ocean science taking place at the Aquarium. We’ll continue to conduct new science every day, to inspire new generations of science-literate citizens, and to use the best-available science to inform everything we do to assure a bright future for our ocean planet. Learn how we use science to support ocean policy, address plastic pollution and climate change, protect marine wildlife and ecosystems, and promote sustainable global fisheries and aquaculture. For scientists seeking to understand how the ocean is changing, perhaps the ideal research instrument would be a time machine. Absent such technology, the Monterey Bay Aquarium has been working to create the next best thing. It’s a new facility called the Ocean Memory Laboratory. For the lab’s inaugural project, researchers have put together a dataset of the feeding habits of eight species of seabirds over the span of almost 130 years. They analyzed archived feathers dating as far back as 1890, using a technique called compound-specific stable isotope analysis, to better understand how the birds’ diets shifted in response to factors ranging from competition with humans to the changing climate. The study exemplifies the promise of the Ocean Memory Lab—the brainchild of Aquarium science director Dr. Kyle Van Houtan, who co-authored the publication together with two colleagues based in Hawaii, Dr. David Hyrenbach of Hawaii Pacific University and Molly E. Hagemann of the Bishop Museum in Honolulu. 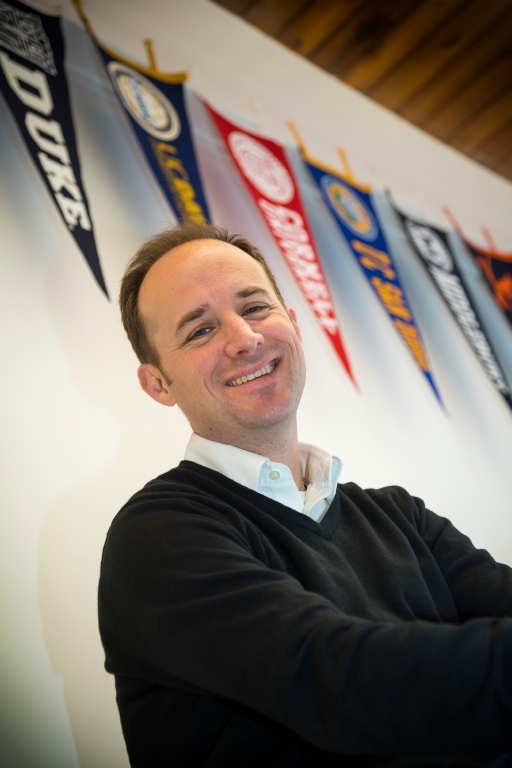 Dr. Kyle Van Houtan conceived the Ocean Memory Lab as a way to learn about past ocean conditions and inform current conservation policy. Identifying novel sources of long-term data is at the heart of the lab’s mission, Kyle says, because conservation projects often lack an informed baseline of ecosystem health to compare against.